Several months ago, we introduced Power BI dataflows as Public Preview. 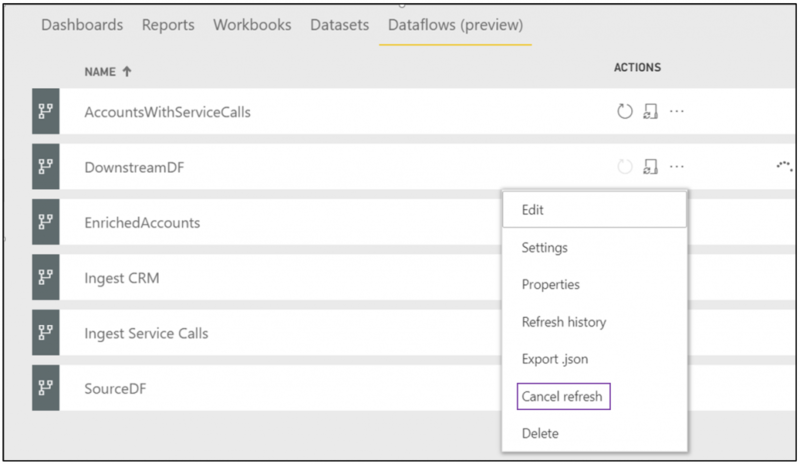 Now, we’re happy to announce that Power BI dataflows are generally available! Power BI dataflows provide business analysts with a self-service data prep and management experience within Power BI, allowing them to collect business data from various sources, clean and transform it — leveraging the familiar Power Query experience and the Common Data Model and land it into Power BI storage, making it available for reuse by multiple Power BI datasets. 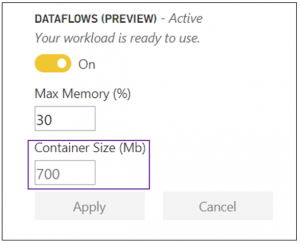 Additionally, Power BI Premium customers can leverage dataflows workload to enjoy additional functionality including dataflow time-based Incremental refresh for faster refresh time than full refresh, Computed entities for transformations on data in storage, and Linked entities which allow users to create reusable ETL logic, powered by our new recalculation engine which automatically tracks dependencies and recomputes data as new data is ingested. Admins can obtain visibility into dataflows health metrics and KPIs using Premium Capacity Metrics app. 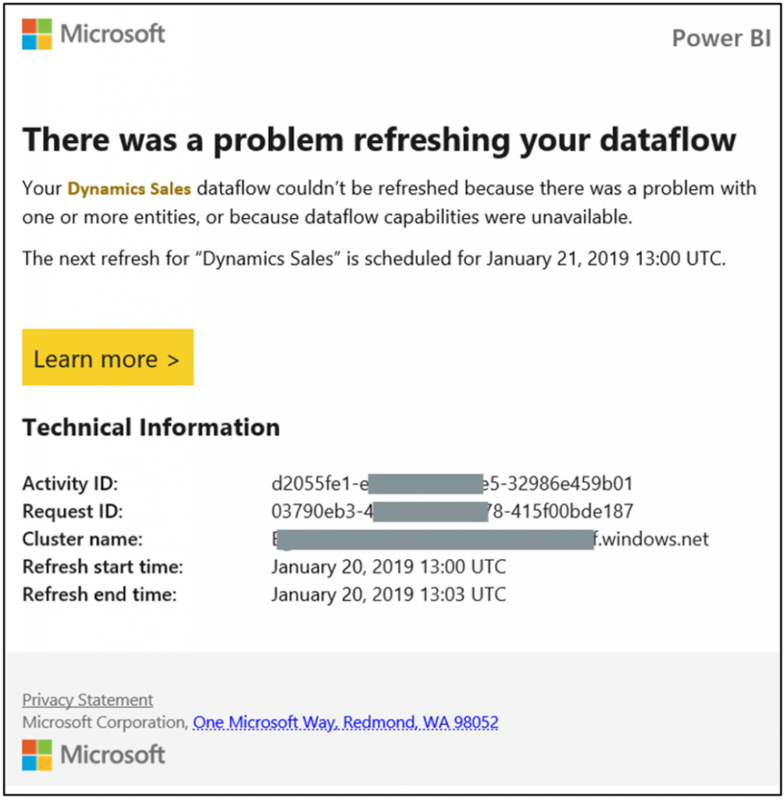 Since our public preview, we’ve been closely engaged with top Power BI customers and with the Power BI community, gathering valuable feedback from the various channels to help us add and enrich dataflow capabilities towards GA. A while ago we shared a list of new dataflows updates, and now I’m happy to share that we’ve added more capabilities, including some of the most anticipated features: email notifications on refresh failures, take ownership of a dataflow, cancel refresh, preserving source entity relationship and additional settings to optimize dataflow workload performance. Let’s learn a bit about each of these new additions. 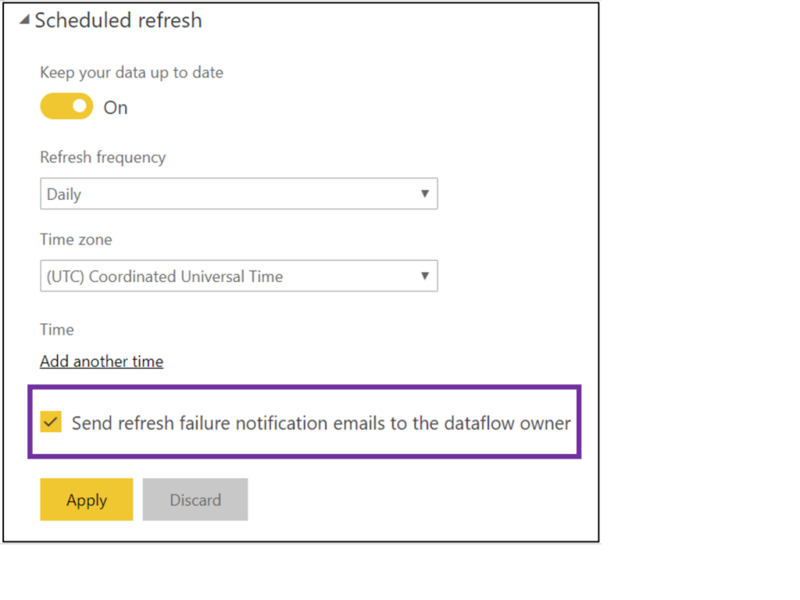 This feature allows dataflow owners to receive an email notification upon refresh failure. This feature was a top suggestion on ideas.powerbi.com and we’re happy to deliver it! 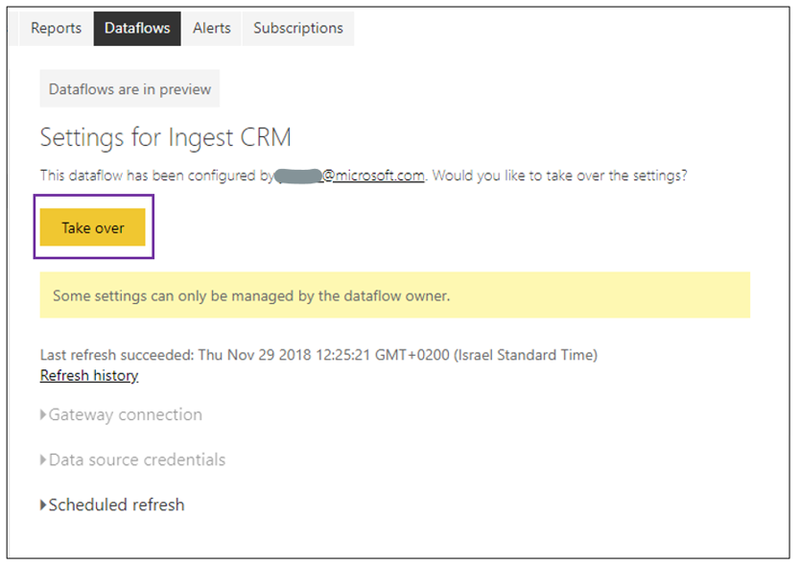 To send refresh failure notifications a dataflow owner, go to Dataflows settings > Scheduled refresh, and select “Send refresh failure notification”. The notification name, next scheduled refresh time, and additional technical information that will help you investigate the failure. Sometimes dataflow ownership needs to move to from one user to another, whether it’s because the current owner is leaving the organization or for collaborating Now you can take over ownership of a dataflow, using the “Take over” option in Dataflows settings. Who can take over a dataflow? Workspace admins and workspace members, if workspace members have permissions to edit Power BI content. In the new workspaces (preview) – Users that have admin, member, or contributor role. Note: When taking over a dataflow the new owner will be required to provide credentials for all data sources used by that dataflow. Sometimes dataflow refresh takes a long time, sometimes too long. Now with the new “Cancel refresh” control you can cancel the refresh when you need to, whether it’s for editing dataflows queries or any other reason. The “Cancel refresh” action is available in the Dataflows page “Actions” menu. Note: In workspaces that are not assigned to premium capacity, dataflow refresh may not be immediate. Dataflow refresh will stop only after completing the current entity refresh. Various source systems support the definition of relationships between tables, so it can be used later to correlate the data and perform analysis on top. In this release, when you connect to a data source and import multiple tables that already have these relationships defined, we’ll preserve the relationships definition from the source to the dataflow. 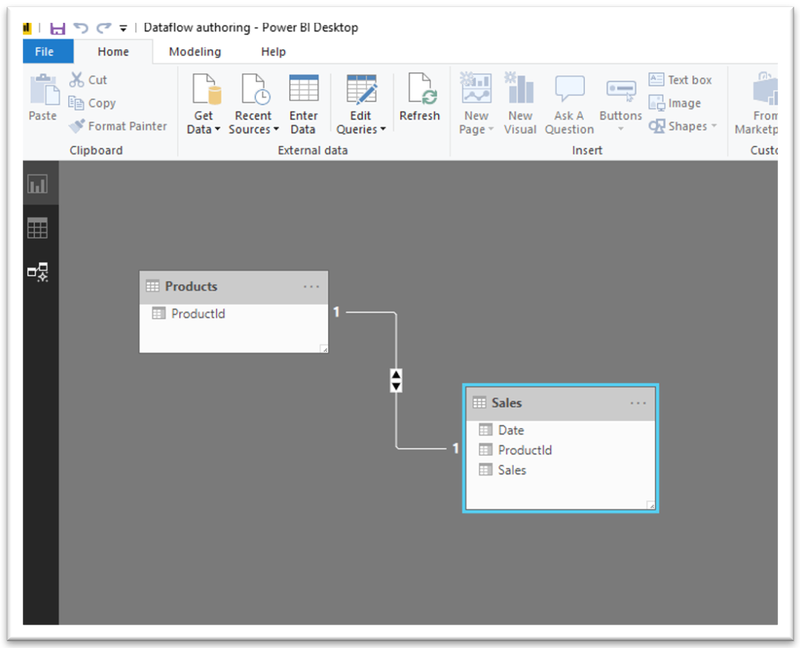 Later, when you connect from Power BI Desktop using the Power BI dataflows connector to the dataflow, you’ll automatically get all the relationships that were defined. You can always edit the relationships between the tables on the Power BI Desktop relationships editor.